Tetris shelves have been around for a while, but Brave Space has now updated them for gamer-purists. 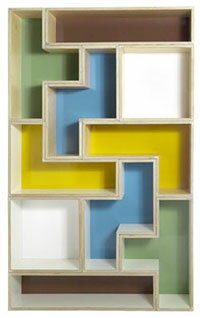 Now in color instead of the original no-back design, these shelves can now match the rest of your furniture. Also improved: the price—we hear it's gone down significantly. We dont' know by how much, but we're guessing "significantly" means it's much less than the $7k for 10 pieces they were asking for last year. Contact Brave Space for a quote.